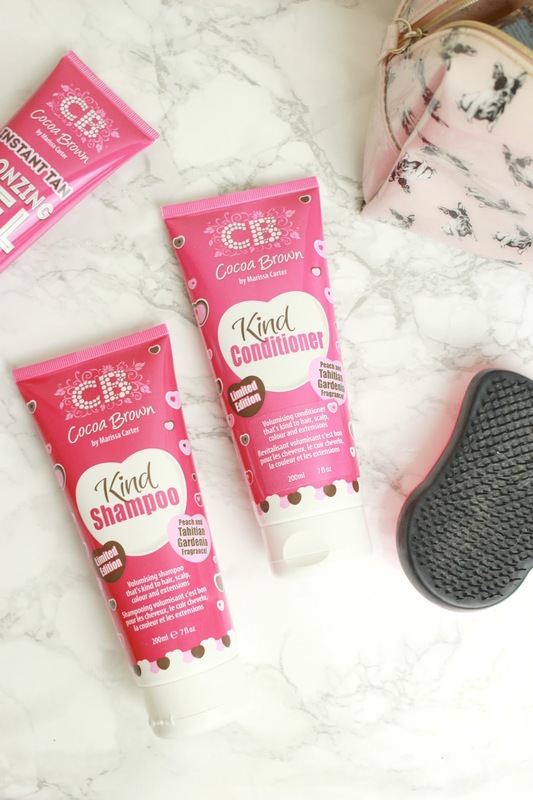 When Cocoa Brown annouced their new haircare range my first thoughts were.... what? wait? tan for your hair?! But I'm blonde! Of course... I was having a total mad moment - obviously they have just branched out and added haircare to their already fabulous range! So... Kind shampoo and conditioner, hello new friends! This duo is specially formulated for sensitive skin and scalps, which is perfect for me and my new bleached head hair! Free from parabens (yay) and pH neutral (double yay) - which means not only are these fine to use daily but it also means this stuff won't interfere your fake tan, helping your glow last that bit longer! Since I've been back to my gym classes I've been washing my hair a lot more so I'm pleased these are suitable for that! I've used these a few times now and have been so, so pleasantly surprised. The products smell lovely (and no smell of biscuits anywhere!) with cleansing agents such as coconut oil and fruit sugars they have a lovely fruity, fresh scent. The part I am most impressed with is the pricing - I pictured these being around £6.99 each.... but online they are just £2.65! Cheaper than Herbal Essences and Garnier half the time - these are a total bargain and I hope they are going out to all Superdrug's to make it easy for everyone to get their hands on them. High Five Cocoa Brown - another fabulous product! ive heard about these but never actually tried them! must! Must try these, I am yet to find a shampoo that I love! !